Today marks the release of Star Trek Into Darkness! Kidlet is extremely excited so of course he needed a themed lunch! I'm joining up with my Edible Geekery buddies to have a little blog hop! So after you check out my awesome lunch click the button at the bottom to go to the next! 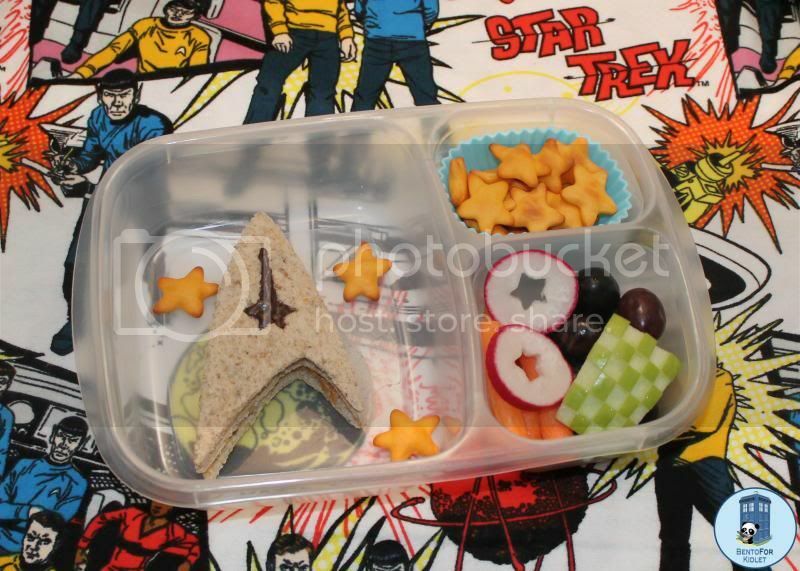 Kidlet has a peanut butter sandwich shaped with our much loved ThinkGeek Star Trek Cookie Cutters and decorated with a tiny bit of dark chocolate, On the side he has star shaped cheese crackers, grapes, checkered apple, carrots, and radishes. Great job! Love the chocolate embellishment. Love that sandwich!! And the radishes are a great touch too! Yummy cuteness! I love it! Setting my phaser to stunning! Awesome lunch, and I love the background!!! I love the sandwich and the star crackers!